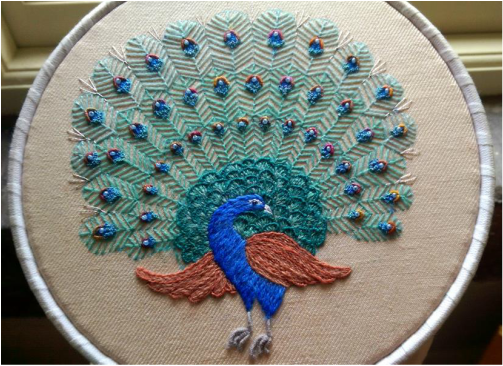 Designed by Cathy and worked on pure linen twill with Appleton crewel wools, the peacock is another project that was inspired by a visit to India in 2015. 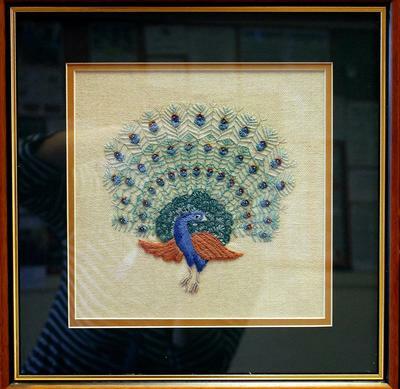 The embroidery also incorporates the use of silk & metallic threads and seed beads. 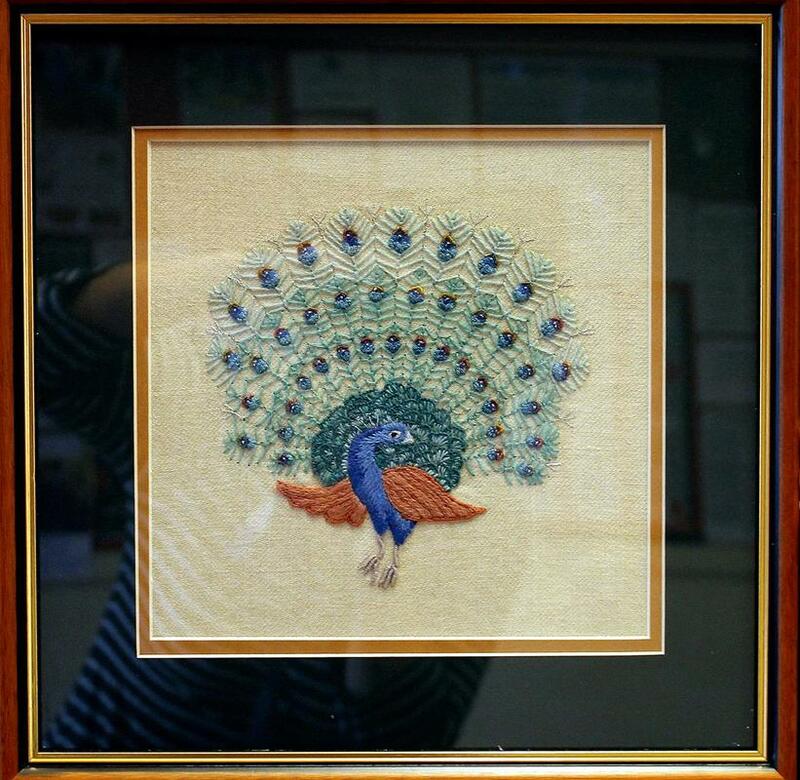 The embroidery itself measures 16 cm x 16 cm. There are more photographs from previous workshops in the Gallery below. Suitable for anyone with some experience of stitching. As a guide only, you should already be able to work stem stitch, French knots and blanket stitch. For those with no experience, the Pomegranate Pillow Crewelwork is recommended as a starter piece. This workshop will be run again in 2020. Please contact us to register your interest. Tea & coffee is provided throughout the day, with home baking. Please bring your own packed lunch. All materials and equipment will be provided, but you may wish to bring your own 8" embroidery hoop if you have one. A seat frame is best, but not essential. Alternatively, you may borrow a standard hoop for the day. Standard and seat frames are normally also available to purchase). 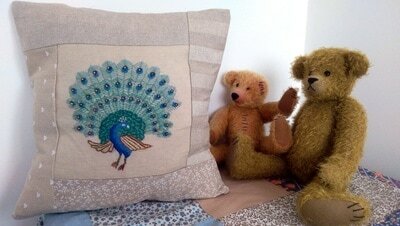 £55 per person including all materials. The design will be pre-traced onto your linen twill. 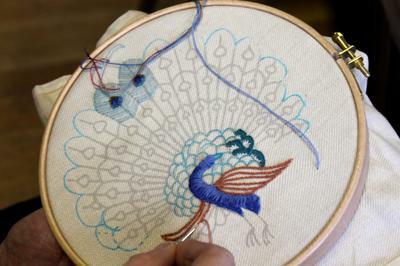 You will work the the various stitches that make up the peacock, including fly stitch, long & short stitch, bullion knots and buttonhole stitch. 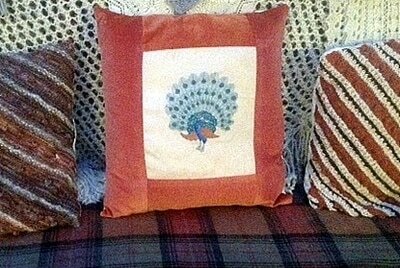 It is not possible to complete the stitching for this project in one day, however you will learn all the stitches and will be given full guidance and instructions as to how to complete the project at home, including ideas for displaying or framing your work. 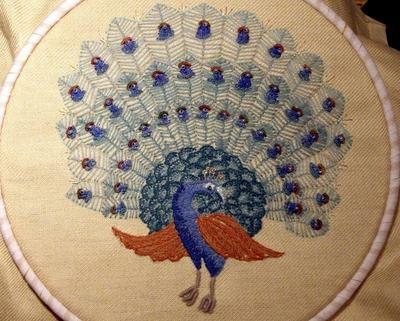 The embroidery itself measures 16 cm x 16 cm and your linen twill will measure 30 cm x 30 cm.